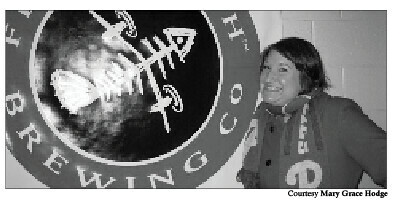 Temple alumn Mary Grace Hodge now works as a brewery representative for local favorite Flying Fish Brewery. “I love Shock Top – definitely one of my favorite beers,” said Frank Michaels, a student sitting at the bar Bob and Barbara’s on South Street. The woman sitting next to him turned and made a face. “I drank sh––y beers in college, too,” she said. “I mean, I like Blue Moon, too,” said Michaels, as he tried to defend himself. “I’Il stand by my original statement,” the woman continued with a sarcastic smile. Mary Grace Hodge, a 29-year-old brewery representative at Flying Fish Brewery, is used to giving advice to undergraduate students. Not your average beer connoisseur, she is somewhat of a Jedi Master, with expertise in multiple areas, always looking for ways to be the mentor. “I want to ensure that our brand is being promoted well, which includes participating in and the planning of events, both large scale and small,” Hodge said. But while she is currently fulfilling her passion working in Philadelphia’s beer industry, Hodge took many sidesteps on the way there. Raised as a “true southern girl” in Alabama to a Presbyterian minister and teacher, Hodge said she was raised in a religious household. While she said she is proud of her heritage and upbringing, she needed a change when it came to looking at schools. This brought her to Drexel University, where she studied marketing and minored in German. Far from Texas, she took her open mind and open heart to the dormitories. It was after graduating from Drexel that Hodge said she began to find herself. After working through a Fulbright scholarship to teach English in Germany, she moved back to Philadelphia and began her graduate work at Temple in 2009 in tourism and hospitality management. In addition to her coursework, Hodge was hired as the graduate extern for student activities. This essentially meant being a resident assistant with different student organizations. Hodge said she felt at home both in the Office of Student Activities and in the hospitality industry. It was at Temple where she began her work in event planning, and discovered her true life’s passion. It started in her applied research class, where she decided to write a paper on craft beer. The paper “focused on the increase in popularity of craft beer in Philadelphia as it connects to something more local and authentic,” Hodge said. She took her southern hospitality into the city once again, this time to the bar scene. She ended up landing an internship with the Beer Lass – a blog that covers food and beer in the city – and loving it. Hodge said she loved interacting with people, being knowledgeable about the industry and was thirsty for more. Her thesis turned into a question of why people went to beer events, and she conducted multiple studies at different bars throughout the city. Some events were large, some were small. Some people treated it like a wine tasting, others just wanted to get intoxicated. All came for different reasons, but it was at the smaller events where she found those who were passionate about learning about different types of craft beers. Then, she said she realized that beer was very much like any other field that develops a fan base. When it came time for graduation and wrapping up her final semester of school in Spring 2011, she sat down and had a conversation with an undergraduate student she had frequently advised as an undergraduate RA. As it turned out, the student’s mother sat on the board at the Painted Bridge with Flying Fish Brewery. She met the girl’s mother, and now spends her days traveling throughout Eastern Pennsylvania, visiting bars, restaurants and distributors that either carry the Flying Fish brand or potentially could. “Building relationships with both accounts and the public are what helps grow the brand,” Hodge said. In this same past year, she started dating her boyfriend Bob, whom she said she had been pursuing on and off ever since she came to Temple. She said with a smile that she could not be happier. As the music blares over the juke box at Bob and Barbara’s, Hodge glances happily at the bar around her. Her spirit and work embodies what the beer industry has done for society. More than a simple medium for getting drunk, it is a way to bring people together from all walks of life. Hodge’s work is about so much more than just selling beer and event planning. It is about offering bits of advice to those that are passionate and eager to open their ears. She reminds students not to worry too much about where life will take them. Matthew Flocco can be reached at matt.flocco@temple.edu. Students started EvntBlazr.com to dish out reviews of the city’s best bars and restaurants. In a time of Yelp reviews, Foursquare and social media, everyone wants to tell people where to go in the city.